Erik Larson’s newest historical saga transports readers to 1933 Berlin, an almost too-familiar time and place that Larson makes compelling by introducing an American family’s view of Hitler’s rise to power. Just as Larson’s Devil in the White City evoked the unreported evil surrounding 1890s Chicago, this account delves into a little known historical figure and his role in the unfolding drama leading to World War II. William Dodd was a quiet University of Chicago professor when Roosevelt appointed him ambassador to Hitler’s Germany, a position none of the usual ambassadorial suspects desired. The unassuming Dodd took his wife, son and reckless daughter, Martha, with him to Berlin and Martha, an assistant literary editor of the Chicago Tribune, immediately ingratiated herself within Berlin society and with the burgeoning Nazi leadership. Her sexual liaisons and friendships offer a rare view of the increasing tensions as Americans and German Jews suffer brutal attacks without consequence. Martha’s naiveté and her father’s essential fair-minded approach afford readers a clear view of America’s isolationism and of the dilettante foreign service of the time. Larson also offers a clear, unvarnished portrait of American anti-Semitism and its ultimate cost. The Dodds’ chatty correspondence with Carl Sandburg, Thornton Wilder and other historical figures was my favorite aspect of the book. Larson also captured my interest with his discerning depiction of the cut-throat tactics some American diplomats used including compromising diplomatic pouches in order to undermine Dodd’s position. Summing it Up: Larson defines the term narrative nonfiction by offering simple stories of relationships that show rather than explain how Hitler and his band of miscreants assembled power so quickly. Read this historical account of the rise of Nazi Germany for its insight into why the world failed to see what Hitler was doing. Enjoy it for its almost gossip-column glimpses of Berlin society in 1933. On a scale of one to five, this wonder deserves a ten. It’s both a swashbuckling adventure and a compelling metaphoric symphony. When word comes that Anders Eckman has died of a fever in a remote Amazon region Marina Singh, his pharmaceutical company lab partner, is dispatched to find his remains and it seems that a Jamesian journey to the “heart of darkness” is about to begin. Yet, this reader found it more like Dorothy’s trek through Oz especially with Marina’s former mentor, the elusive and mysterious Dr. Annick Swenson hidden behind the curtain of the Amazon jungle. Marina’s boss and lover, a man even she calls Mr. Fox, had sent Anders to bring back news of Dr. Swenson’s progress in developing a drug that would allow women to remain fertile their whole lives but the odd doctor remained uncommunicative and resistant to leaving her secreted village. Patchett plots the action as if it were an elaborate mosaic with each piece precisely scribed to fit its neighbor. Marina arrives in the decaying city of Manaus, Brazil where she spends weeks trying to ingratiate herself with a slapstick cast including Milton, a major domo figure, who seems to have the entire country at his beck and call and the Bovanders, a fey couple who hold the key to locating Dr. Swenson. When Marina finally begins her river journey, Easter, a deaf boy Dr. Swenson has rescued, pilots them literally and figuratively into the ever narrowing darkness of the Amazon. They arrive to find the Lakashi tribe carrying torches and ululating in welcome while Marina’s luggage and more importantly her malaria medicine and global phone go missing. Forced to dress as the tribal women and lacking any contact with the world, Marina quickly assimilates into the tribal village Dr. Swenson rules. In a pivotal scene rivaling the best Indiana Jones movie, Marina, Easter, another native and a giant anaconda battle aboard a small pontoon boat. I hate snakes and have refused to read some fine books because of their presence but I was glued to the page during this mesmerizing skirmish. Soon after, Marina visits the area where the Lakashi women chew the bark of trees that allows them infinite fertility and protection from other diseases and she later performs a chilling operation that makes her seem indispensible to the village. Meanwhile Marina forms a bond with Easter and begins to question the imperturbably caustic Dr. Swenson.. A raft of adventures awaits and builds to an unexpected yet thoroughly believable climax. The book has a perfect ending that brings the entire tale full circle and makes me want to read this adventure again to savor the intricate language and plotting. I flew through it completely captivated by the cast and sat in wonder as I contemplated whether Marina would ever be able to click her heels and return to Minnesota. Summing it Up: State of Wonder is a wonder that will transport you to a grown-up “Land of Oz” where native dancers, miracle drugs, incredible dreams, and a jungle so thick and hot it makes you want to shower await you. You’ll beg your book club to abandon their next selection so you can discuss it. If I could I’d adopt Easter, a character I’ll carry with me forever. I adored Patchett’s Bel Canto but this may just top it. Mining the Lake Superior shores of Michigan’s Upper Peninsula, Ellen Airgood creates McAllaster, a hamlet filled with eccentric characters similar to those found in Richard Russo’s forgotten mill towns. Airgood infuses an unlikely blend of rascals and saints with a spirit that seems to come only in remote locales. Madeline Stone, a Chicago waitress about to marry a professor and begin to live her dream of art school, abandons it all to move five hundred miles north to help care for Arbutus, an incapacitated woman she’s barely met. Elderly sisters Gladys and Arbutus are two of the most engaging women to populate a town since the novel Broken for You introduced a disparate cast that made the word community meaningful. Toss in a man with a dream, a mentally challenged uncle, a messed up single mother and her charming son and you’ll be ready to head north to meet this crew yourself. Airgood’s novel is predictable in the way that we want summer reads to be predictable. This predictability makes it flow as the characters behave as real, caring people do when they’re broke, hurt, or damaged yet still manage to do the right thing most of the time. Small town life isn’t for sissies nor is surviving in northern Michigan’s harsh, economically impoverished areas but this novel depicts the troubles and the rewards of opening yourself to others regardless of where you live. I flat out fell in love with these characters and flew through this wonder of a novel determined to drive north to eat at the diner the author runs. Her interviews of several lifelong residents and what must be her keen ear as she serves those who eat at the diner surface in the dialogue that both sings and carries the plot. Summing it Up: Take this feel-good book about a group of unforgettable characters to the shore of your favorite lake for a perfect summer escape. Okay for Now is ostensibly a sequel to Schmidt’s delightful Wednesday Wars but it stands alone beautifully. Doug Swieteck’s Dad is such a jerk that he gives other jerks a bad name. He drinks, hits Doug and his brothers, and loses his job and the family’s home. Lucas, Doug’s oldest brother, troubled as a teen is now in Viet Nam. Brother Chris, a smart mouth, hangs out with the wrong crowd. Because of his incorrigible family, Doug is assumed to be a bad kid and he can’t make friends in the upstate New York mill town where they relocate. Lacking friends and fearing home, Doug visits the town library and sees an Audubon folio open to an arctic tern. The vivid nature of the tern enthralls him and the librarian encourages Doug’s interest and teaches him to draw. Soon Doug learns the significance of the portfolio and that it’s being sold off bird by bird, page by page. Home life worsens as Doug’s beloved Joe Pepitone memorabilia is taken from him, brother Chris is arrested and brother Lucas comes home from Viet Nam with significant injuries. All these problems pale when an insensitive gym teacher exposes Doug’s deepest secret. Doug’s friend Lil and a few adults recognize the fortitude, talent and intelligence that Doug possesses and they support him as he strives to save the Audubon folio and himself. This book is humorous enough for the most jaded boys to love and it’s smart enough for well-read adults to savor. Even world-weary readers will shed a tear or two then cheer for Doug to overcome the obstacles facing him. Nothing should keep this from winning the Newbury Award as best children’s book this year. Book clubs that loved discussing The Book Thief or The Giver will want to add this to their lists. Summing it Up: Buy this for boys ages ten to fourteen and make sure you read it yourself. It’s sure to be an award winner and a classic. The characters in this affirming novel will stay with you for a long time. Dreams of Joy promises to be one of the big books of the summer. Its fast pace will complement a day on the beach and its historical information will sate those wanting more. This sequel to Shanghai Girls stands alone and surpasses the first installment. See's breakout book Snow Flower and the Secret Fan has long been a favorite of book clubs and historical fiction enthusiasts and Dreams of Joy should please them both. See’s latest novel enables readers to connect to those in the countryside during China's Great Leap Forward from 1958 to 1962. An estimated 45 million people died in China during the famine of those years yet most of us know very little about that famine. 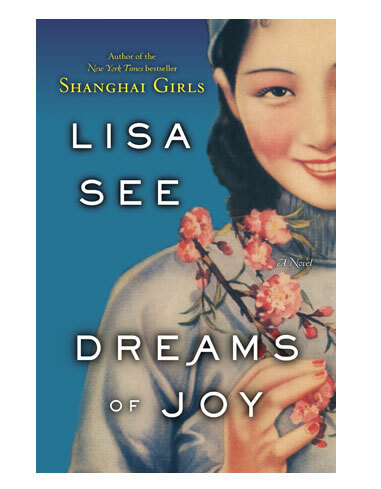 Dreams of Joy allows us to see it through the eyes of Joy, a headstrong University of Chicago student, who believes that China will offer a utopian life and an escape from family problems. Joy’s mother, Pearl, who grew up in Shanghai and was sold into marriage in Los Angeles in the 1930s, rushes to China to convince Joy to come home. See fashions the theme of maternal love throughout the novel in a manner that will have book club members clamoring to share their thoughts. Joy’s reconnection with her biological father, a famous artist, allows See to paint the countryside in colors that illustrate the profound changes wrought by the Mao regime. As Joy assists her father in teaching art to the peasants, the reader is able to “see” the land and the people in a new way. This device works to make the people and the land visible and it balances the emotional shading See uses to make her characters real. Summing it Up: Read this to learn of a famine that didn’t need to occur and enjoy it for the depth of the character development. It will satisfy both book club members that love history and those wanting a page-turning story.